Irish history teachers are a mournful bunch. Their job is to tell children a series of sad stories, filling their heads with tales of dashed hopes and doomed endeavors. When the teachers come into the classroom, the children look up with baleful eyes, wondering what misery is in store. The Flight of the Earls is one such epic saga of shattered dreams but little is known of the Swiss chapter in this story. Short version: In 1607, a group of increasingly marginalised Irish nobles, their families and followers set sail for mainland Europe, looking for Spanish support to challenge English rule. On their way to Spanish-controlled Milan, they passed through Switzerland. Do I need to add that things didn’t work out so well? The nobles died in exile, after being diverted to Rome by the Spanish, who had in the meantime switched to being friendly to the English. The loss of these great Ulster families marked the end of the old Gaelic order. And what about the Swiss connection? Travelling with the group was a scribe, Tadhg Ó Cianáin, whose job it was to record the fateful events of the day. His account of the journey has survived and been translated into English. Ó Cianáin said of the Swiss people that they were “the most just, honest, and untreacherous in the world, and the most faithful to their promises”. A smaller group of 30 Irish men and women arrived in Basel in March 1608 and travelled from there to Lucerne. They then crossed Lake Lucerne heading for the Gotthard Pass. On St Patrick’s Day 1608 the party crossed the Devil’s Bridge near Andermatt in the lower reaches of the Gotthard Pass. This was the toughest part of the journey at the end of a legendary cold winter, as Ó Cianáin describes. “The next day, Saint Patrick’s day precisely, the seventeenth of March, they went to another small town named Silenen. From that they advanced through the Alps. Now the mountains were laden and filled with snow and ice, and the roads and paths were narrow and rugged. They reached a high bridge in a very deep glen called the Devil’s Bridge. One of Ó Néill’s horses, which was carrying some of his money, about one hundred and twenty pounds, fell down the face of the high, frozen, snowy cliff which was in front of the bridge. Great labour was experienced in bringing up the horse alone, but the money decided to remain blocking the violent, deep, destructive torrent which flows under the bridge through the middle of the glen. They stayed that night in a little town named Piedimonte. Their journey that day was six leagues. A little slice of Irish and Swiss history for you there. 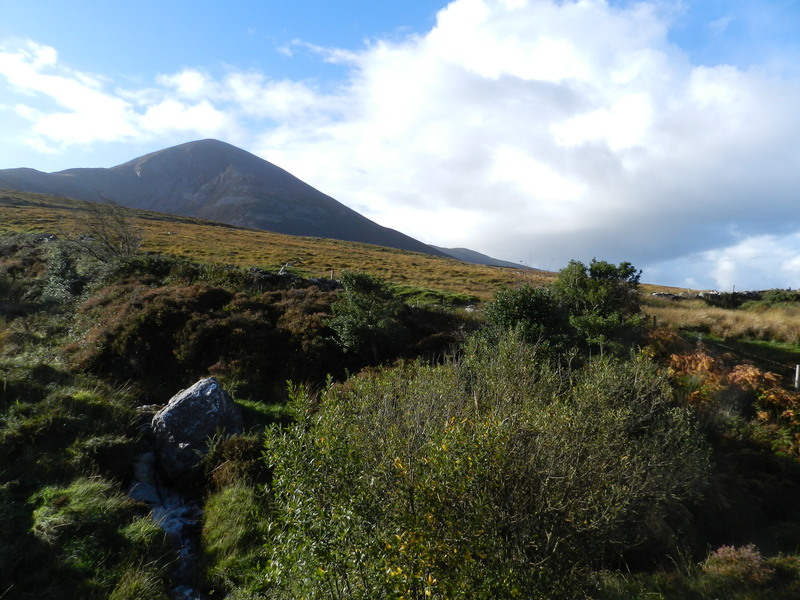 The photo above is a view of Croagh Patrick in Co. Mayo, a famous mountain associated with the man himself. Incidentally, traces of gold have been found there which indicate significant gold deposits but that’s another lost fortune which will never be mined because of the cultural value of the site. Hi Lindamarie, isn’t it funny how that happens? Nice to hear from you! All is well, thank you and I hope the same goes for you. I have two more weeks left in work. The countdown is on! Congratulations on dual citizenship, Clare! I voted in local elections yesterday and was really looking forward to flashing my new ID but, small as our village is, the election helpers knew me and waved me through! Thanks Marius! It is a great feeling just driving around and thinking this is my country too now. I have my criticisms of Swiss naturalisation procedure (future blogpost) but still glad to have made it through. Thank you Anne. I even put grated Gruyere in the mashed potato today! Congratulations, Clare and Happy St Patrick’s Day too. Enjoyed this blog post – I didn’t know about that Swiss connection but am not surprised. The Irish are everywhere after all! Wow, getting Swiss citizenship is a big deal – have you learnt the secret handshake yet? Thanks for the Irish/Swiss history lesson, very interesting. The first rule of Swiss citizenship is never talk about the handshake 😉 . Thanks for stopping by! We go to Rathmullan on holiday every year and I always think of the Earls and their fated flight!